This is the best way I have found to paint Lexan Bodies. No matter what scale your painting. Use the same steps. This is one of my latest paint projects. I thought I would put together something to show how easy painting can be. Here is how the truck was painted. Hope this makes painting easy for you. First thing that you need to do is place your body over the chassis and mark the holes that will be cut out. Things like the body post are best marked and cut before painting. Wheel cutouts should be marked. But, Should be cut out after painting. After the marks and cuts are made. You will need to wash the body in warm water. Dish soap works well for this. After you have washed the body. 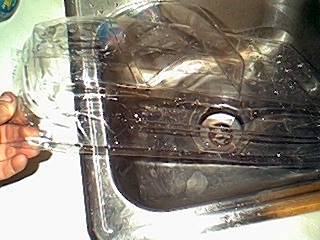 It is a good idea to wash it a second time. It will pay off for you later. Be sure to wash both inside and outside of the body. Now comes the fun part. Some people use the Blue masking tape. I use the white but I also make sure I press it good around the edges just before I start painting. You can have many colors if you want. I try to stay with 2 or 3 colors at the most. Just remember to paint the light colors first. Note: The tape on the grill. Now I am ready to apply the paint. Notice I have the body masked so that over spray will not be a problem. You can also add some strips of tape looped in the center and stuck to the body. These will form handles so you can hold the body as you paint. Press all tape edges one last time. Then you can start painting the body. It is better to spray a few lite coats of paint rather than a heavy single coat. After you have your first color on you can pull the tape in order to paint the next color. Remember many lite coats are better than one heavy one. Here you can see the tape handles come in handy. The grill was taped off when the red was painted and the tape was removed then the black was painted. Then remove the tape and your body is almost complete. You can paint a body in very little time. The paint will dry very quickly if you use lite coats. It is a good idea to remove the tape as soon as you get the paint on the body. NEVER leave the tape on while you let the body dry. The longer the tape is on the body the better it will stick to it and the harder it will be to remove. Let the body dry over night. (I know this is tough to do.) I use to try to complete the painting project in one day. I have learned it is far better to let the paint cure and then finish the job. NOTE: Be sure and lay the body upside down so the paint can cure. After cutting on the marks. Sand or use a dremel tool to smooth the edges. Make sure all cut areas are smooth. Check the fit as you go. On my truck the rear engine pod moves so I have cut enough of the body so the pod will move but will not hit the body. Here you can see the body is getting decals. To protect the paint from the body post scratches. I place two layers of masking tape over the post location and then cover it with another layer of tape. I do this also any where I have anything that comes into contact with the body. It will keep the paint from being rubbed off over time. Here are a few pictures of the finished body. Making your own decals just got easier. 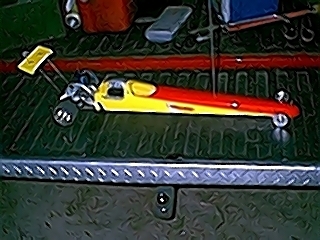 This Dragster was painted the same way. Click on it to see more pictures. The body was placed over the chassis and the wheel cutouts were marked, the body post holes were cut out along with the engine area. The body was washed twice and then dried. The windows were masked off as well as the second color area. Then the body was painted. This took about an hour. Then all the tape was removed and the body was left to dry overnight. The next day I cut out the wheel wells and sanded all cut edges. I put on a few decals and added the tape on the inside to help protect the paint. Then the body was complete. Good Luck on your painting project. If you have questions just ask I will be glad to help you.